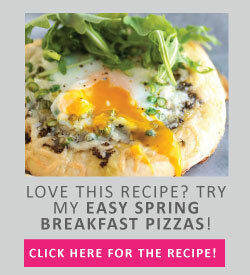 These quick and easy breakfast toasts are perfect for busy weekdays and weekend brunches alike! Ready in 15 minutes and full of summer flavor. Vegetarian. 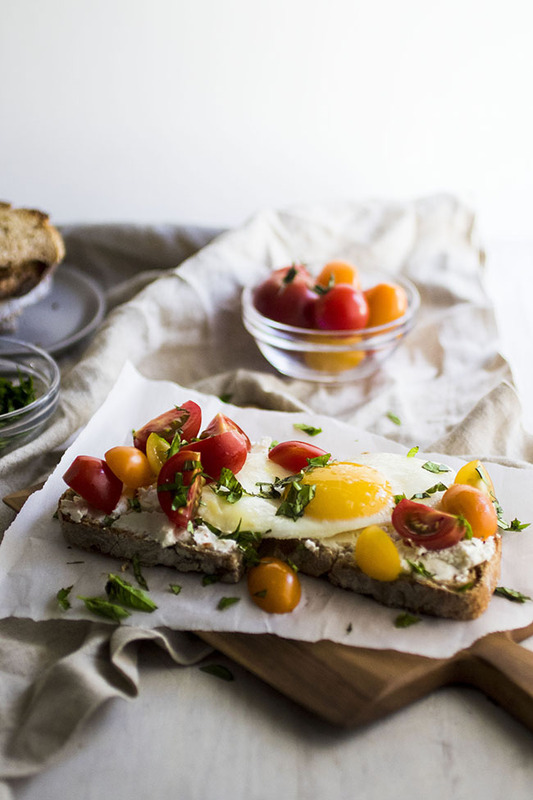 OMG OMG OMG OMG OMG THESE BREAKFAST TOASTS. You guys – I’m honestly just telling you how to make toast and then top it with cheese and an egg and some other stuff today. But can we still count this as a recipe? 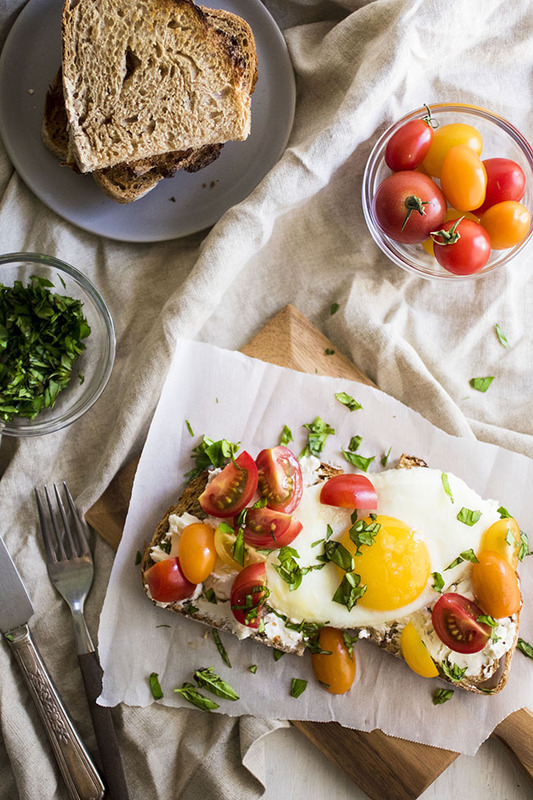 Because you neeeeeeeed these breakfast toasts in your breakfast life. 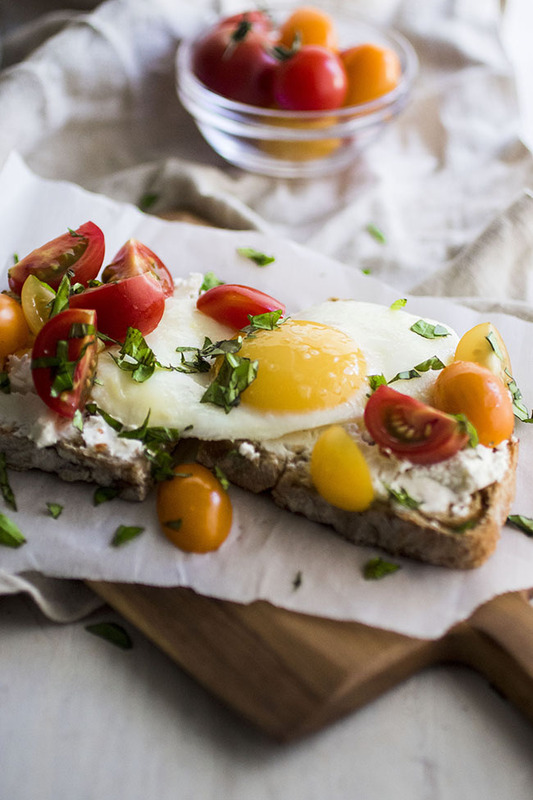 I’ve been making this easy basil + tomato + sourdough + runny egg + GOAT CHEESE HELLOOOOOOO toast for breakfast almost every single day for the last two weeks. I just CAN. NOT. STOP. It’s too simple. Too full of summer and tomatoes and goat cheese and did I mention there was sourdough bread under all that goodness? Now that I’m back from FEAST Portland, I’m back to my regular-ish routine (but don’t worry, because you have approximately 1909690384693467 FEAST-y pictures comin’ atcha over the next few weeks) which means back to email-answering and gym-going and vegetable-eating and BREAKFAST-TOASTING. I typically make this as a fork-and-knife type situation, but if you’re feeling adventurous you could toast up another piece of sourdough goodness to throw on top and enjoy it sandwich-style. 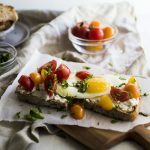 Feel free to mix up the herbs and tomatoes based on whatever you have on hand – this is a verrrrrry forgiving breakfast, which makes it equally perfect for busy weekday mornings and fancypants weekend brunches alike. 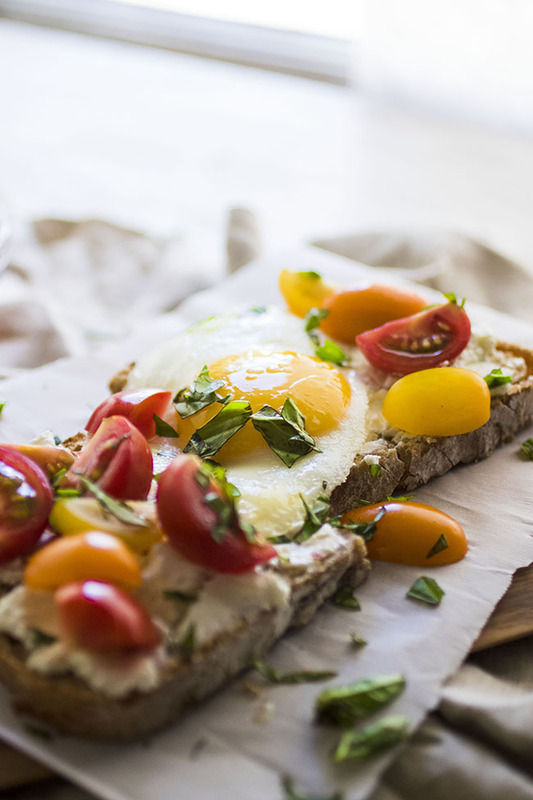 Easy-yet-elegant breakfast toast with summer produce. Toast sourdough (I use the toaster, but you could also bake it or use a toaster oven) until it’s lightly browned. Set aside. While sourdough is toasting, melt butter in a large saucepan over medium heat. Crack eggs one by one into the saucepan and cook to your desired doneness. I did sunny side up eggs here, but you could also fry them over easy or over hard depending on your preferences. Top eggs with salt and pepper to taste. Spread 1 oz. of goat cheese over each piece of toast. 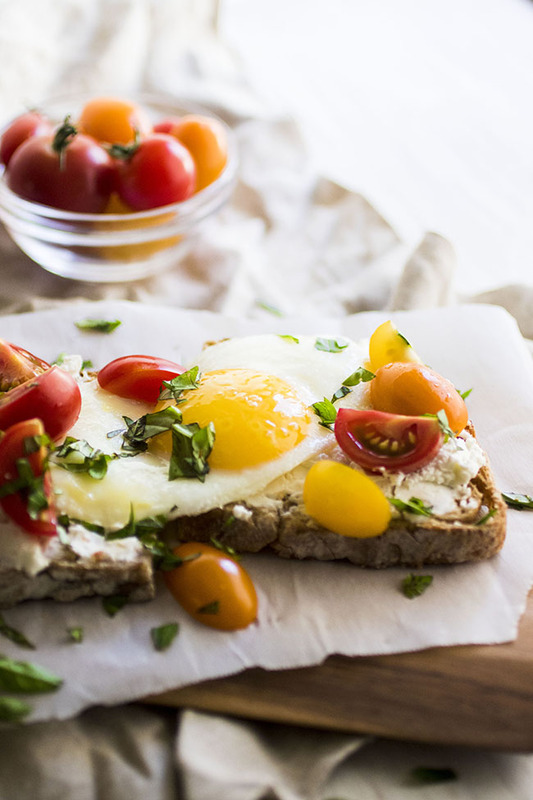 Top each toast with an egg, a handful of tomatoes, and a generous pinch of fresh basil. Add additional seasoning to taste and serve immediately. You could also add a mashed avocado to your toast. If you’re into that kind of thing. Well my dear, you’ve outdone yourself with this one. 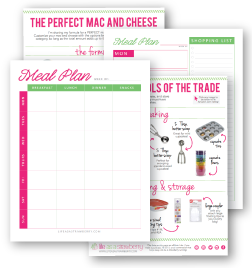 Does a more Coleyish recipe exist? I don’t think it does. Also, is that Wide Awake bread I spy??! Can’t wait to get my hands on that when I’m back in Ithaca in a few very short weeks! Thanks, m’dear! Wegmans bread, actually – my faaaaave. We’ll eat ALL THE BREAD together when we see you! I can’t wait! !